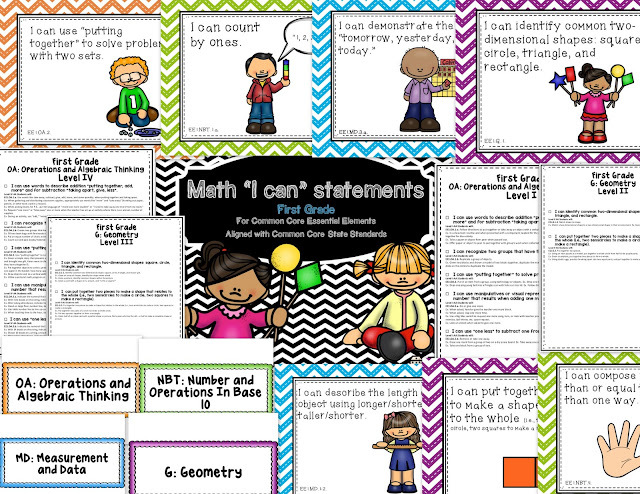 Math "I Can" Posters- First Grade addition - All Things Special Ed. Hello, It has been a few since I have blogged, just getting in my last few days of vacation until I head back to school. I have added the First Grade addition to the math "I can" poster and teacher checklist for the Common Core Essential Element standards. These are great to hang in your room as anchor charts and to remind your students (and you as well) what you are working on to meet your math goals. This is also a great resource if you don't know where to start when teaching students math. Look at the grade level your student is in and determine which performance level they fall into (there are 4 levels) and work towards those goals. Lets face it- as special education teachers, we are usually left to figure things out ourselves and don't typically have a curriculum to work with. This is a great way to know what to teach and to teach at grade level appropriate tasks. Also if you like those and are working with the CCEE check out my multiplication and division packets. Great for beginning learners in these two skills- as well as for younger regular education students! !